New Google Update March 2017 - Possibly targets links, content quality. There is major chatter in the SEO community of a Google Update targeting Links, and also possibly content quality as well. Published: Mar 9, 2017. 21:15 +0100. Current: New Google Update March 2017 - Possibly targets links, content quality. There is major chatter in the SEO community of a Google Update that appears to targetBlack Hat SEO, in particular, backlinks. There are also some suspicions that content quality is targeted as well. We take a look at the rumors, along with the SERP trackers and comments by Google and other experts to try and ascertain what is going on. We will first take a look at the SERP trackers to gauge the scale of the update, and to check that there is some basis to the rumors. Following that, we will look at the chatter in the SEO community for insights as to what it is targeting, and finally report on comments made by Google about the recent volatility. You will find below all the latest charts from the SERP trackers. It is clear the chatter in the community about an update has some basis to it, with significant spikes showing on all the trackers. The Rank Risk Index shows a relatively quiet middle of the month, with the major volatility showing the 7 February Update (which we covered here), and the more recent volatility today, March 9th. SERPmetrics show an almost identical picture to that indicated by the Rank Risk Index, noting that the latest data is only up to the 8 March, so it may be useful to check this chart tomorrow when the data for the 9 March is released. MozCast is kind of interesting, as it shows a spike in volatility around March 1, which was also picked up by Sensor (see below). The data for MozCast, also only goes up to the 8 March, but it does show a clear spike on that day. Google Grump shows a sharp spike on the 9 March, as well as a smaller spike around the 3 March. The great thing about Google Grump is that you can filter by location. The chart below shows the data for Mobile and Desktop, Globally. Google Grump United Kingdom. © Accuranker. We are not sure what to make of it, but it may suggest a phased, or ever so slightly delayed rollout. Sensor is a brand-new tracking service from SEMrush, and while it only covers the US at this point, it does break down the volatility by sector for greater insight. There is clearly some volatility showing on the 8th and 9 March, as well as a small spike on the 2 March. Some categories are much more volatile than others on a long-term basis, for example, News. Even though categories such as Health show a low volatility, they still saw a spike over the last few days relatively speaking. Books and literature do not seem to be overly affected. At present, we don’t see anything particular that stands out between the categories, but if after checking it out yourself you see something interesting, feel free to let us know in the comments. Regardless, this will be a useful tool to check each time an update happens. 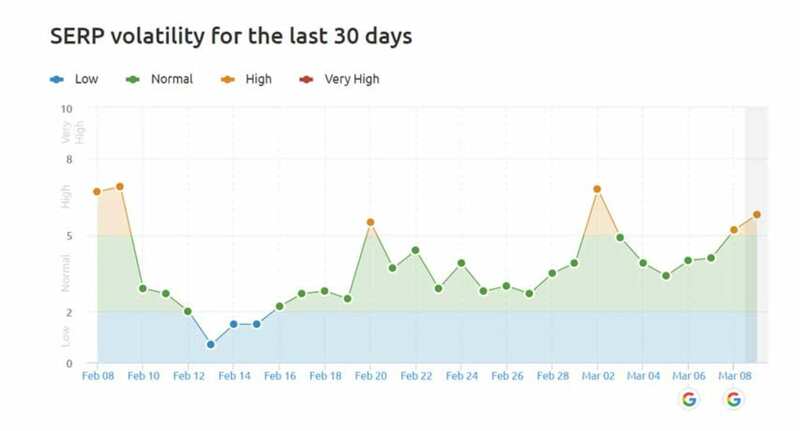 One good thing to note about SEMrush’s Sensor is that the data is updated several times a day. There is significant chatter on both Webmasterworld and Blackhatworld. You shouldn’t read too much into these comments as we can’t verify whether they are experts, or just merely speculating. Instead, we look for general trends and use that to inform our other data. We have heard from John Mueller, confirming the usual “We make changes almost every day,” and Gary Illyes, rather humorously naming the update “Fred.” In fact, Illyes declared that all future updates would be named “Fred.” As such, we are ignoring him on this! But, putting the rather useless responses from Google aside, we did gather some excellent information from Glenn Gabe at G-Squared Interactive, and Paul Macnamara, an SEO consultant. Not convinced that this update is solely link based. We suspect that the views by Glenn Gabe and Paul Macnamara contain the best information to go on at this stage. It would certainly make sense to roll out several changes at the same time to confuse the blackhat spammers. It is evident from the chatter in the SEO forums that Private Blog Networks (artificial links) appear to have been hit quite bad, and those who were hit suffered significant rankings drops. There is little mention of content quality, and we suspect that is because the rankings drop for any quality related changes were much less. Either way, it is evident an update happened, and equally clear mixed signals are indicating that it is targeting several parts of the Google Algorithm. 30 day fully featured trial - This is by far the better deal, and provides a fully featured trial. The only issue is that you must provide billing details to take advantage, but it is definitely worth doing.